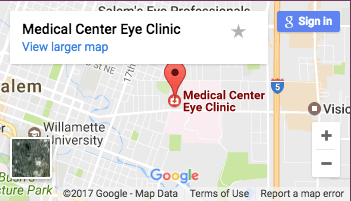 Medical Center Eye Clinic’s complete optical department in Salem, has a wide selection of the latest in eyewear designs. With an optical dispensary right in our clinic, you can experience professionalism and excellent service customized to your needs. We invite you to visit with one of our opticians and view our selection of high-quality designer frames and lenses. Eyeglasses – We offer a wide selection of current designer frames. Our staff of knowledgeable and friendly opticians will help you choose the perfect frame for you to fit your lifestyle. Premium Lenses – From single vision to progressive lenses, we have premium products to help you see clearly. We give you the information needed to help you make the best choice for your vision needs. No two lenses are alike. Shop and compare. We are here to help you be an informed consumer and understand the choices you make about lens options. Contact Lenses – Custom fit by professional opticians. With a current prescription, we provide a selection of all major brands. Important to note: contact lens prescriptions expire after 1 year. Monday-Friday: 8:00 a.m – 5:00 p.m.